Political activist, member of the South African Communist Party and the Federation of South African Women. Susanna Johanna Fischer (nee Krige) was born on the 23rd of February, 1908 on the family’s smallholding in Silverton, near Pretoria. Her father, P.S. ‘Tottie’ Krige was a land surveyor and her mother, Emmy Bernsmann was the daughter of a missionary and a devout Christian. The Krige's had quite a standing as a family – they could trace their ancestry back a few hundred years in South Africa and included people such as Uys Krige, a famous poet and translator. Her father had been General Smuts’s aide-de-camp during the First World War, and his sister, Isie, was married to the General. Fischer attended the local farm school where two teachers had the care of everyone from grade one to seven, all within one larger and ill-equipped room. However, Fischer was a bright student and advanced quickly. She went to Pretoria Girl’s High School, an English school. At high school Fischer was very talented and energetic at sports especially hockey and gymnastics and in her final year she became prefect, she matriculated at the age of sixteen. However, one day she skipped school to watch rugby match and as a consequence had her prefects badge confiscated. After school Fischer wanted to become a veterinarian, but because there was no money for a professional degree, she decided to become a teacher. Fischer met her future husband, Bram Fischer, in 1927 in Bloemfontein while she was on women’s hockey tour playing for the Transvaal University College in Pretoria’s team. At their first meeting they paid little attention to each other, although Bram later recalled noticing her ‘very very blue’ eyes. Later, Fischer took her first job, teaching at the Housecraft School in Bethlehem in the Free State, and she met Bram again in May 1930 while he was on the circuit court route with the Judge-President. In January 1931 they declared their love in the cemetery in Bethlehem – a story which became part of family legend. Very soon after this Fischer was fired from her job at Housecraft School for taking too much interest in sports and not enough in the girls she taught. She also openly said she did not like the school. In 1932 Fischer did her High Education Diploma at the University of Pretoria and in 1934 she began working at a farm school in Jachtfontein, Johannesburg. In the same year her mother died. In 1936 she went to South West Africa (Namibia) to initiate a domestic science project at the request of the Director of Education. Although Bram and Molly had become secretly engaged, their engagement became official on 8 July 1936. In April 1937 Fischer left for Europe where she traveled in England and Germany returning to South Africa on 23 August. On the 18th of September 1937 after six years of courting Bram and Molly were married. On 14 August 1939, their first daughter, Ruth, was born and a few years later, on 16 June 1943, another daughter, Ilse was born and in August 1947 their son Paul was born. During this time, under Bram’s influence Fischer became involved in South African Politics. Together the pair participated in food raids and Violet Weinberg recalled Fischer, in an Indian store selling consignments of rice and sugar at the government price of 6d a pound, and giving all the due proceeds to the owner. She also organized a fundraising dance for the Guardian in Beaumont Street; she participated in street collections for the Communist Party, and organized fÁªtes and jumble sales. Fischer was involved in canvassing for Hilda Watts when she ran for the Johannesburg City Council. She was also responsible for procuring funding for over 80 striking post office workers. Fischer worked in African crèches, established ‘refugee homes’ for African children and gave a series of talks in municipal nursery schools to mothers with whom she helped set up co-operative clubs to but wholesale and double their purchasing power. During this time the Fischer family took in Nora Mlambo, the niece of their gardener, to live with them – much was made of this, some even calling it Bram’s unholy communist ‘experiment’ to bring up a Black child in a White family. In 1945 Fischer stood as the Communist Party representative for election to Ward 3 (Hospital/Braamfontein) on the Johannesburg City Council. However, she lost the election, receiving only 461 votes to the United Party’s 2387. 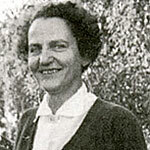 In 1954 Fischer, as the secretary of the South African Society for Peace and Friendship with the Soviet Union (SASPFSU), left for a trip to London, her exact reasons for going are not documented but it is mentioned that she collected money for the SASPFSU and for New Age, the successor in theGuardianline. Whilst in London she received an invite to travel to China from activist Ruth First. The trip led her through East Germany, Poland and Czechoslovakia under the auspices of the Women’s International Democratic Federation (she had obtained the endorsement of the Federation of South African Women to establish her credentials) to Moscow and ending up in Peking to celebrate the fifth anniversary of the Chinese Revolution on 1 October. After the banning of the Communist Party in 1950 it reconstituted itself as the South African Communist Party and continued underground. Fischer was in a SACP women’s group with Violet Weinberg. In January 1955 Fischer was ordered to resign from her secretarial position of the South African Society for Peace and Friendship with the Soviet Union by the Minister of Justice and was banned from all gatherings for five years and from about three dozen organizations. In 1956 Fischer’s father died of a stroke. In April 1960, during the first wave of arrests under the first State of Emergency, Fischer was arrested. On 13 May she took part, with the other White women in detention, in a hunger strike that lasted around 90 days and was only called off after Bettie du Toit became seriously ill. After 3 months of detention in Pretoria Fischer was released. Over the next few years, the Fischer family faced trying times as more and more of their comrades and colleagues were arrested, went underground or into exile. During the Rivonia Trail Fischer was quite involved in supporting the defense team, which was led by Bram, as most of the work was done at their Beaumont Street home. Many people close to the Fischer’s remarked, however, that Molly was always nervous, anxious, depressed and a little lonely, as she was banned and cut off from her customary activities. In 1963 Fisher’s daughter Ruth married Anthony Eastwood. At the end of the trial, in June 1964, Bram and Molly decided to drive down to Cape Town for a holiday and to celebrate their daughter's 21st birthday. On 13 June at around 6.30pm, just hours after leaving Johannesburg, they were involved in a car accident and Molly was killed. She was cremated and hundreds of people came to her memorial service. • Stephen Clingman (1998), Bram Fischer: Afrikaner Revolutionary. Cape Town: Mayibuye Books.